The highly anticipated Super-Bantamweight bout between Carl Frampton and Scott Quigg is on, and either man has a fighting chance of winning – but not if you believe the bookmakers. 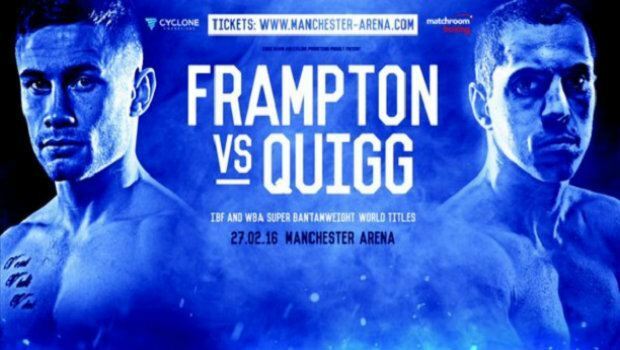 Taking place on February 27th at the Manchester Arena, the Frampton vs. Quigg fight will not only pit two of the world's top 55kg fighters against each other, but it will also unify the IBF and WBA world titles, the two premier world boxing organizations. With each fighter putting their respective belts on the line (Frampton IBF, Quigg WBA), the pressure will certainly be on, but many pundits are already tipping Belfast's Frampton to emerge victorious. With two title defences to his name, Frampton has shown both sides of his game in recent fights. After stopping Chris Avalos in his first title defence back in February last year, Frampton then proved his mettle in his United States debut. Taking on up-and-coming Mexican Alejandro Gonzalez Jr, Frampton found himself on the canvas twice in the opening round. With many questioning his heart before the fight, Frampton soon proved the doubters wrong by rallying to edge out his young opponent on points. That combination of strength and determination has made Frampton the hot favourite in the latest betting markets. As expected, Paddy Power Sports has the Irishman as the top prospect with odds of 8/15, but it's certainly not a case of patriotic bias tipping the scales in Frampton's favour. A look across the online markets shows that Frampton is the betting favourite with every major operator. At 888 Sports the odds on a Frampton win are also 8/15. However, for those in the Quigg camp, there are plenty of reasons to back this strong contender. Like Frampton, Quigg is on a hot streak with five wins in his last five fights – and it's this sort of form that's earned him the respect of legendary trainer Freddy Roach. The long-time coach of Manny Pacquiao reportedly told Quigg's trainer, Joe Gallagher, that people were surprised Frampton had such a tough time against Gonzalez. "They were all laughing about him struggling with Gonzalez. I think Barry (McGuigan) asked for his opinion on who'd win between the two of them and Freddie said Scott Quigg," explained Gallagher. Although Roach hasn't confirmed or denied the comments, it's clear the bout won't be as one-sided as the bookmakers may believe. As it stands, a Quigg victory with the aforementioned bookmakers is priced between 5/4 and 6/4, which could mean there's some value in a bet on the underdog. For a more personal perspective on the two fighters, it's useful to look at their common opponent: Kiko Martinez. Both Frampton and Quigg have stepped into the ring with Martinez (the former doing so twice) and both have triumphed. For Frampton it was late stoppage and a comfortable points victory against Martinez, while Quigg managed an impressive second round knockout when the pair met in July 2015. Anyone comparing the showdowns with Martinez side-by-side would likely pick out Quigg's as the most impressive. However, the man himself is backing Frampton to stand victorious, as reported by Sky Sports. According to Martinez, Frampton has the superior skillset, as well as the strength advantage over Quigg. "Frampton will win against Quigg. He's the more complete boxer. He is stronger as well." This sentiment is (perhaps unsurprisingly) one that Frampton shares. Talking to the Manchester Evening News, Frampton explained that he's confident he can out-box Quigg and not get drawn into a toe-to-toe brawl. "If I use my brain I can make this easy, it’s about boxing ability. I could go in there and get rid of him and stand toe-to-toe and beat him that way, but that’s giving him a chance. If I’m clever, this fight can be easy." If that's the case, then a bet at 4/5 with William Hill Sports for the fight to go the distance is definitely attractive. Of course, for those on the fence, there's always the option to speculate on a draw but with both men out to prove a point, it's unlikely a draw will be on the cards. Whichever way the fight goes, it's certainly set to be a barnstormer in Manchester on February 27th. Get ahead of the other punters by visiting Paddy Power Sports today for the latest odds and markets offered on Frampton vs Quigg!